Holiday placemats :: We provided holiday placemats to the Arnprior and Renfrew Meals on Wheels programs for delivery at Christmas. These placemats have Christmas themed fabric on one side and another fabric on the other so the placemats can be used throughout the year. See photos and more information on our blog. Auction Quilt for Arnprior Hospital :: We made a quilt for theArnprior Regional Health Foundation’s auction at the annual "Knight in the Maritimes" dinner in May 2018 to raise money for equipment purchases for the Arnprior & District Memorial Hospital. 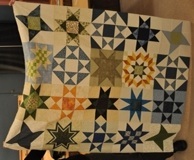 We worked on this quilt at our January guild meeting and here's what transpired on auction night. 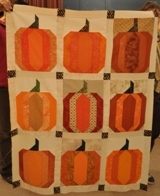 ​Slab Block Quilts :: In early 2017 our guild members made "slab blocks" for quilts completed at the Canadian Quilters' Association's Big Quilt Bee. These 2,614 quilts were given to kids in Ronald McDonald House Charities across Canada in 2017 in recognition of Canada's 150th birthday. 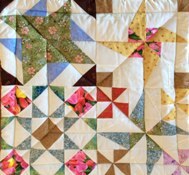 We were later given some leftover slab blocks to use in quilts for other charities. 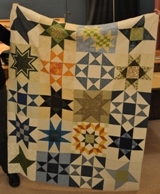 We provided batting and backing and our quilters completed 4 quilts that were donated to Quilts of Valour Canada. See the blog post for more information. Wheelchair Lap Quilts & Bibs for The Grove Nursing Home:: We made 16 wheelchair lap quilts for the comfort of residents of The Grove Nursing Home​​ in Arnprior. These lap quilts featured velcro straps that attach to the chair arms. Kits that include some blocks, batting, and backing were provided. Instructions for Making Wheelchair Lap Quilts​ See photos and more information in the blog post. Quilts for Ronald McDonald Houses :: Our guild participated in the Canadian Quilters' Associations Big Quilt Bee which produced an amazing 2,614 Canada 150 themed quilts for the kids at Ronald McDonald Houses across Canada, in celebration of Canada's 150th birthday in 2017. Guilds from across Canada made and donated 12 1/2 inch blocks incorporating at least one piece of a special Canada 150 fabric. Approximately 135 blocks were constructed at our very successful "slab block" workshop in early February bringing our total to about 200 blocks. At our hands-on February guild meeting, our guild members assembled more than 240 blocks into 13 quilt tops for the Big Quilt Bee. The quilts were quilted at Quilt Canada in Toronto, ON in June 2017. Those kids at Ronald McDonald House Charities are going to love these quilts. 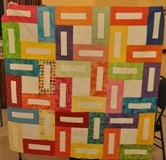 ​A quilt for the palliative care room at The Grove Nursing Home in Arnprior. See the blog post for more information. 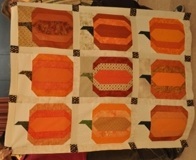 A quilt for the Arnprior Tim Hortons outlets in raising funds for their ​Send a Kid to Camp programme. See the blog post for more information. 150+ Little preemie quilts for the babies in the Rich Little Special Care Nursery at the Civic Campus of the Ottawa Hospital​. Jan Smith, Guild Treasurer delivered the quilts to this neonatal unit in the summer. 52 Holiday placemats to the Arnprior and Renfrew Meals on Wheels programs for delivery at Christmas. These placemats have Christmas themed fabric on one side and another fabric on the other so the placemats can be used throughout the year. 200+ Christmas stockings to the Arnprior and District Food Bank, which were stuffed with toiletries by Arnprior CWL members and included in their Christmas parcels. 15 small lap quilts - 7 for the travelers on the Sunshine Coach Service of Renfrew, and 8 for the Arnprior-Braeside-McNab Seniors at Home Program. Both groups transport seniors to medical appointments. Our lap quilts are provided to ensure trips are more cozy and less draughty for the clients. 2 large lap quilts for victims of the fire in Fort MacMurray. 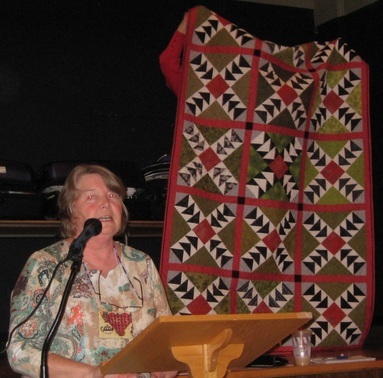 Fort MacMurray, so tragically hit by fires that destroyed so many homes, had a quilt program. We waited until there was a secure centre established for the quilt storage and distribution, before mailing our quilts. 1 lap quilt to the Rexall Drug Store in Arnprior for a community fundraising event to support the fire and police services. 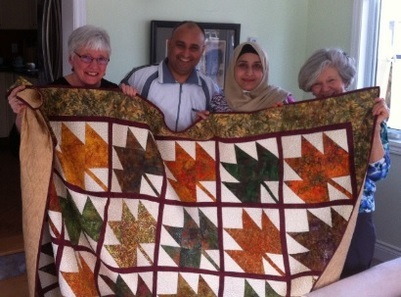 ​Guild member Shirley Fedoruk made this beautiful maple leaf quilt for a Syrian refugee family that was recently welcomed to Arnprior. Framing the happy recipients of the quilt are Shirley (left), and fellow guild member Margaret Fisher (right) who is very active with the Project Arnprior Welcome sponsoring initiative. We have had a very productive year for our Charity projects. Here is a recap of our charity activities. At the beginning of the year a last minute plea for stockings go us approximately 70 stockings which were filled by the ladies at Anne Cruickshank's church and donated to needy families. A great community effort! We then made placemats for meals on wheels. We donated 25 to the Arnprior Meals on Wheels program. We have 7 left that will go to either Arnprior and/or Renfrew this coming December. Renfrew had received placemats in 2013 and they did not respond to our request in the fall of 2014. We will approach them again in 2015 to get placemats to their members. 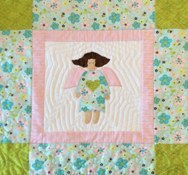 Our preemie quilts keep coming in. Our current count is 109 for the 2014-2015 guild year. They will get dropped off in August. I am optimistic that our number will grow to close to 150 by the time they are sent in. I would like to remind guild members that Eversoft Batting has generously donated batting for the preemies. We just received enough for 150 more preemie quilts. They have been supporting this effort for a number of years, I will have a thank you card at the meeting for anyone who would like to sign it. 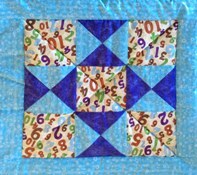 As far as larger quilts, we started the year with 13 lap quilts. At our sew night for charity we made 8 tops, all but two have been completed. We have given 7 away already, one to the family in Cobden who lost their home, and the balance to the Pheonix Centre in Renfrew. We have 6 more that will be going to the following: SPCA auction,Dunrobin grocery golf tournament for Children's Wish Foundation and to three of our members who could use a warm quilty hug.